Sometimes, I wonder what God has in mind for me, since He gave me a heart to love the things I do, which are in mighty short supply in the desert: water, flora, and fauna. There is life here in the Sonoran Desert. There are animals, a few. And there are plants, hardy and prickly though they may be. But there sure isn’t much water. I’ve always longed for greener pastures, literally. But, God gave me a husband who is a native of this hot, dry, brown Valley of the Sun, and I’ve adjusted my expectations of what might be lying just around the corner, waiting for me. 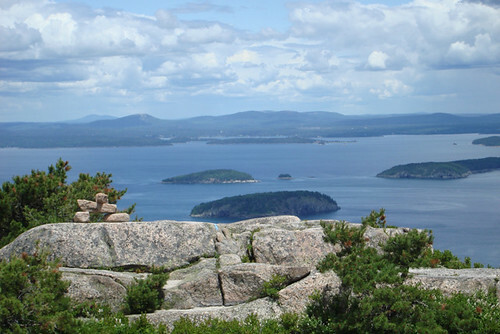 Acadia National Park is not. Nor the Oregon coast. Not even the Mississippi bluff area of western Illinois, where my maternal grandparents had their farm, and — which I recently heard with a yelp of joy — which my Uncle Allyn is farming a bit of, again, with his recovering health. 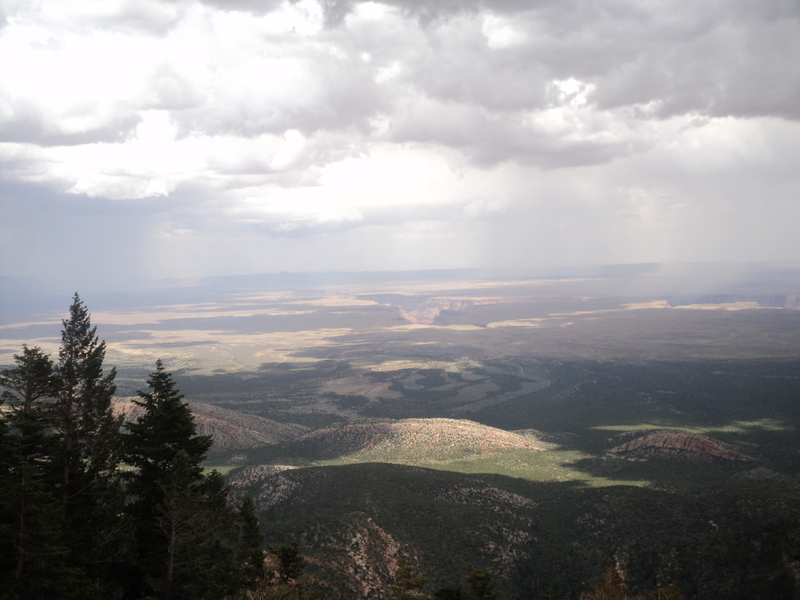 There are days as I look out at the landscape of 100+ days of 100°+ when I am tempted to despair, and my heart just longs for cooler, greener climes. So, I pull out a picture book and read to one of my little girls. Today, my oldest nephew’s girlfriend and I were having a mostly-joking Facebook conversation about her moving (or the two of us taking a road trip) to Maine. She was up for just about anywhere on the upper reaches of the northeastern United States, but I steered her to Maine. 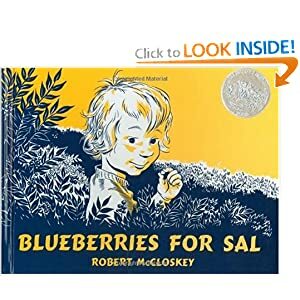 In this Caldecott Honor book, three- or four-year-old Sal picks blueberries with her mother and gets "all mixed up" with a mother bear and cub eating blueberries of their own. For those of you unfamiliar, please check out the books from your local library, or buy them. Now. Please. Also a Caldecott Honor. In which 6yo Sal wishes upon a feather (instead of her first lost tooth, which fell into the muddy pebbles, digging clams with her father) and travels to quaint Buck's Harbor for groceries and the wish-fulfilling cone with her 2yo sister, Jane, and their father. The books show the progression of the author’s family in the 1950s (when they were written) which spent summers in Maine. 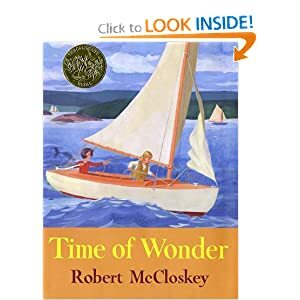 They have beautiful illustrations and apt prose, which shows exactly how adept McCloskey was at thinking with a child’s mind, and seeing with a child’s eyes. After the Facebook conversation, I read Time of Wonder to Fiala, before her nap. Looked at the pictures, more than actually read, as Time of Wonder, the Caldecott Medal winner for 1957, is told in second person, and has a more “grown up” prose than the first two books about Sal and Jane. It shows both girls, aged about 12 and 8, “manning” their own rowboat and small sailboat (sans life jackets), jumping from rocks along the cove with a bevvy of other children, and weathering a hurricane with their parents, partly by sing-shouting The Battle Hymn of the Republic. …through the fog you hear Harry Smith over at Blastow’s Cove start the engine of his lobster boat and go out to pull his traps. I wondered if Harry Smith was a real man. He was. I found myself sad to read that one Harry Smith, of Little Deer Island, Maine, was buried in the Blastow’s Cove Cemetery in 1957. It must have been not long after Time of Wonder was published. I found myself also remembering the incomparable Calico Bush, whose author, Rachel Field, often wrote poetry, apparent in her Newbery Honor prose. Calico Bush is set off of the coast of Mount Desert Island, which is home to most of Acadia National Park. Suddenly, this sounds very familiar. My memory is short, but at least I’m consistent, eh? I guess my point of this point — similar to the last one on the very same subject — is how I just don’t know how to sort all of these thoughts. I mean, I know that allowing myself to indulge in discontentment is dangerous. Letting it sit and percolate in my mind is unwise; I can easily become really unhappy about just about anything, any situation, and anyone in my life if I allow myself to go there. So, I don’t. 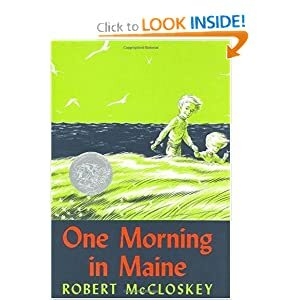 I don’t live in Maine, and can’t conceive of anything that would lead us to Maine, and I think it would 100% be a fruitless and frustrating endeavor to try to figure out how we could or why we don’t have a summer house on a private island in Maine, like McCloskey’s family did. But, on the other hand… my Father God created me with a love for that particular kind of beauty, and a wistful longing for that sort of slowed-down, simple life, living in community, surrounded with an achingly beautiful piece of His creation. Did He do that for nothing? I mean, did He make my heart to love that so, for no purpose, or just to teach me the Godly discipline of not allowing myself to become frustrated and discontented? Possibly, but I don’t think so. I hope not. Last year about this time, I was dreaming of taking a trip there, someday soon, paid for by the thousands of dollars I’d make, writing. I have made some, but, golly! In order to MAKE money writing, you have to have the TIME to devote to it, and fit into someone else’s agenda. That part was less successful. I’ve had a few other offers for employment in writing, but it’s just not fair to any perspective client to hire me, then to have me perpetually be unavailable, even if that makes any Maine trip tarry. My hubby works with a guy, though, who has a house in Maine… Hmm… Maybe I should find out where, exactly, that house is… Thinking, thinking… I don’t think my hubby would consider that appropriate. I’m sure he’s right. One way, though, or another… but it has to be the right way, in the right time. I *KNOW* that; it’s just hard to adjust my thoughts on the matter, especially as these visions dance in my head. Posted on June 7, 2011, in Books for children, Character Development, Loving Nature!, Summer Plans, The Dear Hubby, The Kids, Travelling, Writing. Bookmark the permalink. 5 Comments. Acadia National Park is absolutely beautiful. There’s a lovely little place there where you can eat and the view is just amazing. I think it is perfectly normal to long for a place that is other than where we are. Well, Dee Dee… In my observation and experience, “normal” is not always healthy, nor even Godly. Know what I mean? OTOH, I think we are also meant, as people, to have vision and to dream… It’s just that, with everything good, the enemy finds a way to pervert it, or to take it to a level or a place where God never intended for us. I’m still sorting that out in LOADS of areas in my life. I went from being super-dreamy to not allowing myself to have any dreams at all — largely because if I pursue a dream, it effects at a minimum six other people directly, and some of those pursuits would simply be selfish — to dipping my toe back in the water, so to speak, and trying to get some Godly order and wisdom into my dreaming. I have lived long enough to be assured that whatever it is that God wants for me is truly the thing that would best make me happy and be a blessing to EVERYONE, not just my own soul… So, it’s more like, “OK, God. Are you in this dream?” I just want to be healthy and live the life He wants for me, lived to the fullest… not be off chasing my own “normal” desires and unhappy with the life He’s placed in my hands, because I could really easily go there, if I let myself. Doug’s message on Sunday really spoke to me, especially the part where he said that often the very thing that God has intended to be the vehicle to our wholeness is what we so often reject. I’ve seen that play out in my life time and again. The grass too often looks greener elsewhere… I want to find the balance between having vision for something greater — from His hand and with His blessing — than where I’m at, yet not be angst-ridden and bitter with the lot I have now. KWIM? About children dying: It has always seemed to me that in most stories (true and fictional) about American settlers is that it was more expected that some of one’s children just wouldn’t make it out of childhood alive. I think our mindset has changed radically in the last 100 years; we expect that SOMETHING will come along and save our ill children from death, and by the grace of God and the invention of antibiotics and other helpful medical practices, something usually does! I’m certain that no one was blase about the death of a child, but it wasn’t quite the surprise then, as it would be now. No one was saying, “Why me? Why my child?” because it happened to everyone, every family around them. *Spoiler Alert!! * Yeah, I knew the mindset was really different in regards to children “back in the day” but for some reason it was still really shocking when I read that book. I think part of it may have been the fact that I so strongly disagreed with the one person who suggested that the mother (sorry, I can’t remember any names right now!) burn her girl deliberately so that she would stay away from the fire. So it kind of made me mad that that’s why she died, haha… I taught my daughter to be careful with woodstoves and oven without actually burning her. But… now that my son is coming up to that into everything stage, I have a feeling that he may be a different story.